Forget diamonds, shoes are a girl’s best friend! Guys we know you like them too (there’s a section here for you). When it comes to buying the perfect pair of shoes, it can become a daunting experience rather than a fabulous one. So here are some tips to help you select the correct shoe for work. • If you have a wide foot try go for a half size – so if normally a 5 choose a 5 ½ – makes all the difference. If wearing ankle straps don’t have the skin bulging out between straps. Don’t have your toes creeping over the front end of sandals. If your feet are on show ensure that you don’t’ have cracked heels, dirty nails, chipped nailpolish. Stay away from nail art and too fashion forward nailpolish like black, neon colours. • Stacked/wedge heels are great, especially if you are on your feet a lot. Fantastic for thick ankles. They can look very casual for work if the wedge is in rope or canvas type material. • Kitten heels are low and delicate. They are extremely versatile and may be worn with anything from cocktail wear to cropped pants. If you are not comfortable with high heels; the kitten heel is a compromise, not too high to fall off but high enough to elongate the calf. • Ballerina pumps/Flat shoes are best worn on casual Fridays. 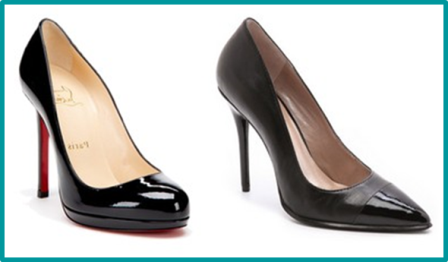 • Pumps, court shoes, peep toes look the most formal for work. Buy peep toes – you can wear them in summer and winter. • An appropriate and comfortable heel height is 5-6 cm. The highest you should go in the workplace is 10 cm. • Contrary to popular belief, it’s the position of the heel – not the thickness – that’s essential. Look for styles where the heel is right under the heel bone, not all the way at the back of the foot, to keep you pain-free and balanced. Yes you can save now only to buy later…again and again! Check out the stitch work, glue work, the material, will it last a long time? The best-quality heels have soles that are stitched on, not glued. Look for even stitching. Also look at how much care the shoes require, will you be able to commit to the care? Rather have 4 pairs of great quality shoes than 100 pairs of plastic ones. • Avoid 2 tone shoes or very seasonal colours – they are very limiting and go in and out of fashion very quickly. Don’t waste your money! • Rather opt for more neutral (black, charcoal, brown, stone)colours that will work with a range of outfits in your wardrobe. • Buy at least 1 great accent colour shoe that can stand out as the focal piece in an outfit –think red shoe, black and white shift dress. • The vamp of the shoe is the section that cuts across your foot at the front and the more it exposes your foot the longer and leaner your leg will appear. • The more your foot is covered by the shoe/boot, the shorter your leg will look – short = fat. • Skirts that are knee length or longer look best with a low vamp shoe. It elongates the legs and makes you look taller. • Stay away from thick soles and platforms if you have heavy lower leg rather go for a medium to thin sole that will create a more flattering and balanced effect. • If you want to make your legs look slim buy a shoe with a longer length toe end. A square or round short toe end will make you leg appear shorter and chunkier. A longer rounder toe (it does not have to be pointy) will make the leg appear slimmer. • Large feet need to avoid very pointy toes, rather choose a square or oval cut. • If wearing a skirt or a dress a shoe matching your skin tone will make you look taller. • For men the only colours necessary in a business wardrobe are black, a very dark brown or ox blood. No grey shoes please! • Slip on shoes need to be in a good quality leather with a discreet clasp or buckle. Unsure if you or your staff are putting the right foot forward? Professional Impressions Impression Management & Personal Branding experts is proudly powered by WordPress and BuddyPress. Just another WordPress Theme developed by Themekraft.